Hamilton CapTel is committed to providing you with proven captioned telephone technology. That’s why we’re working on some new changes to our mobile and web-based services. Whether you’re an Android or iOS smartphone user or looking to see every word a caller says on your tablet or computer, Hamilton CapTel has a solution for you. If you have any questions about Hamilton CapTel products, please contact our Customer Care team. Android’s latest operating system (Android 8.0), called “Oreo”, is now being widely deployed. The new update has surfaced compatibility issues with the Hamilton CapTel App for Android. We recommend that mobile users who rely upon the popular Hamilton CapTel app delay updating their device so they can continue to make and receive calls with captions. The current Hamilton CapTel app for Android will continue to function with Android operating systems 2.2–7.1. Want to know when the new update becomes available? Please fill out the form and we’ll notify you as soon as it’s released! What if I already updated my device? It’s okay – you can continue to use Hamilton CapTel through your browser on a PC/Mac or tablet. Learn more about our web-based solutions. iOS 11 was released by Apple® last fall and thousands of 32-bit apps no longer work on mobile devices. The Hamilton CapTel app is among those that will not currently function with iOS 11, and has been removed from the App Store. The current Hamilton CapTel app will continue to function with iOS 10 and previous supported versions. The Hamilton CapTel Development Team is working to finalize an updated version of the app that is fully compatible with iOS 11 to be available in the App Store soon. Updates to the operating systems on Apple and/or Android devices do not affect the use of Hamilton CapTel for PC/Mac - there continues to be no special equipment or software to download. All that’s required is an Internet connection, standard web browser running the latest publicly available browser version, any telephone (mobile or landline) and a Hamilton CapTel account. Learn more about our web-based solutions. Updates to the operating systems on Apple and/or Android devices do not affect the use of your Hamilton CapTel phone. Rest assured we are committed to providing you with proven captioned telephone technology you can count on. If you want to be notified when the Hamilton CapTel app is ready and available for download with iOS 11 or Android 8.0, sign up and we’ll let you know! Generally, Hamilton CapTel will work on Internet browsers running the latest publicly available version. There may be older versions that are no longer supported and, in some instances, current versions that are not yet supported. Please contact a Hamilton CapTel representative if you have any questions about the compatibility of your current browser version with Hamilton CapTel. 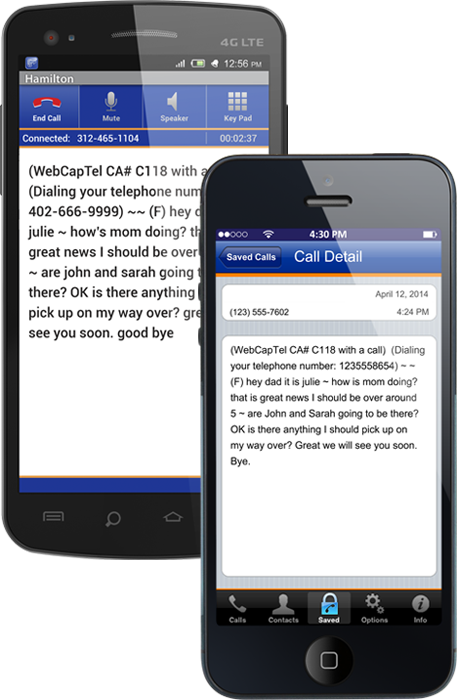 Voice and data plans may be required when using Hamilton CapTel on a smartphone. Copyright © 2018 Hamilton Relay. All Rights Reserved.